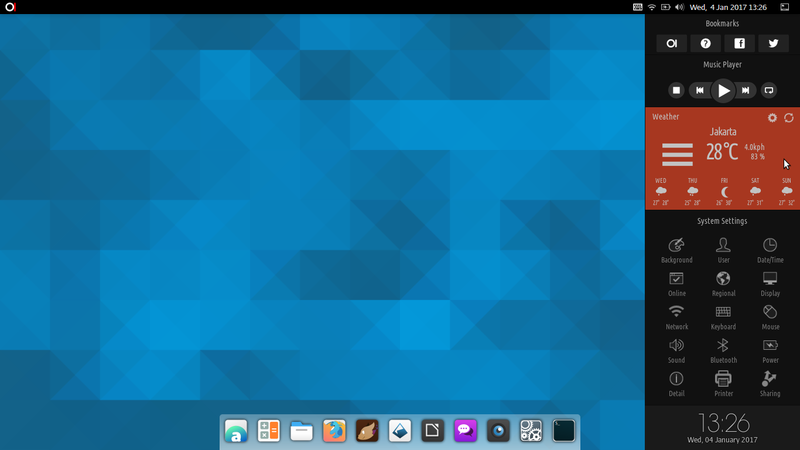 Raven, the Super+A menu, is the special right panel on Budgie Desktop Environment. It's represented by a white door icon with a left arrow on it beside the power icon on the top panel. It's interesting as it's fun to show/hide in end-user's perspective. 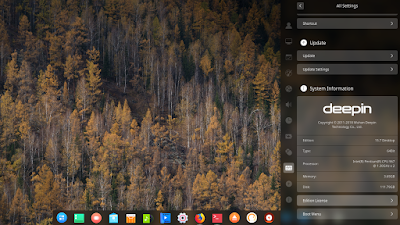 It's unique, compared to same right-side panel concepts on BlankOn and deepin, it has own name Raven while being very minimal yet usable. See more below. This is the continuation after the first part talked about the Top Panel. Enjoy and please wait the next part about Applets! Comparing the same Raven Panel on both OSes produces same output. Raven is permanently located on right side, regardless your horizontal panel being on top or bottom. Surprisingly, Budgie is not the only DE to have right panel. There are two other DEs, namely Manokwari (from BlankOn OS) and DDE (from deepin OS) known to have such thing. Compared to the two others, Raven looks the most simplistic. But only Raven given a shortcut key (Super+A) while Manokwari's or DDE's one missed it, you must either click or push the cursor to certain corner. To open Raven, simply either press Super+A or click on the door button on top. It consists of three parts: Calendar, Volume, and Playback applets by default. If we open up the Notification tab, of course it shows recent notifications such as chats and finished downloading. By default, first section is Calendar, second one is Volume Control, and third one is Playback. 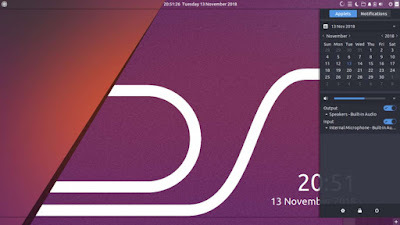 Nothing special, just a usual calendar you can change the month by rolling your scroll mouse button. Next section will be Volume Control. Nothing special, just normal sliders to adjust input and output sound volume. But notice the check marks there are not buttons, not clickable. Play some audio with Rhythmbox Music Player and you will see the cover artwork here. Video will show here too, but only the metatags, not the video itself. No difference to other DEs' centralized playback indicator, here, you can control the media being played to pause and switch between tracks on a playlist. Most bottom section of Raven displays three buttons we often access: Settings, Lock Screen, and Log Out. 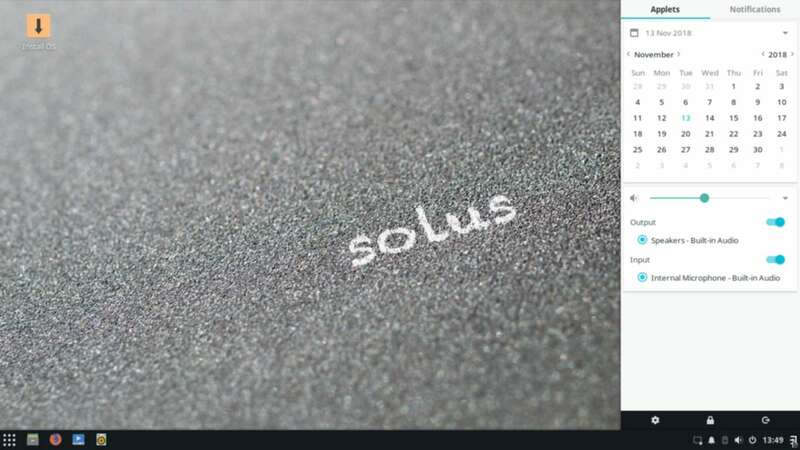 Using Budgie system on public area will be convenient this way as you just press Super+A and click Lock logo there to lock your laptop. 8. I Cannot Configure Raven! Unfortunately, Raven is not configurable. 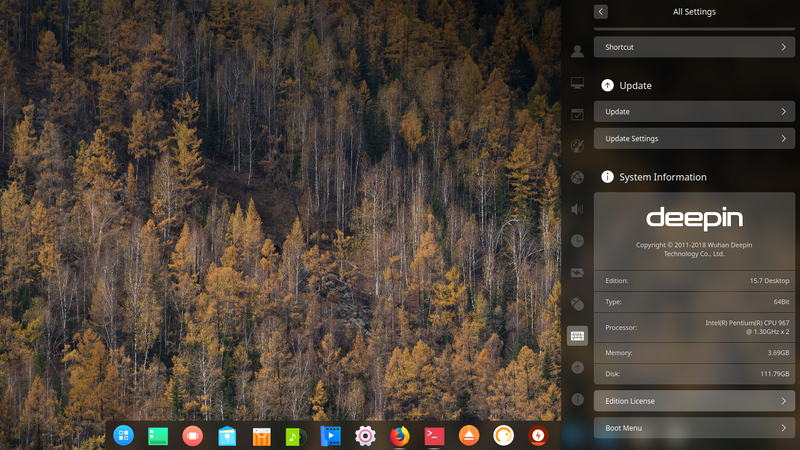 I cannot find any clue on Budgie Desktop Settings or even on the start menu. Surprisingly, even BlankOn's and deepin's panels are also not configurable. I don't know why, but honestly it will be better if user has option to rearrange applets on it. For example, remove calendar and replace it with the Places applet. Or, switch position so it shows calendar on bottom and playback on top. However, for now, we have no such option for Raven. This one is the only thing I missed on Budgie. That's all. 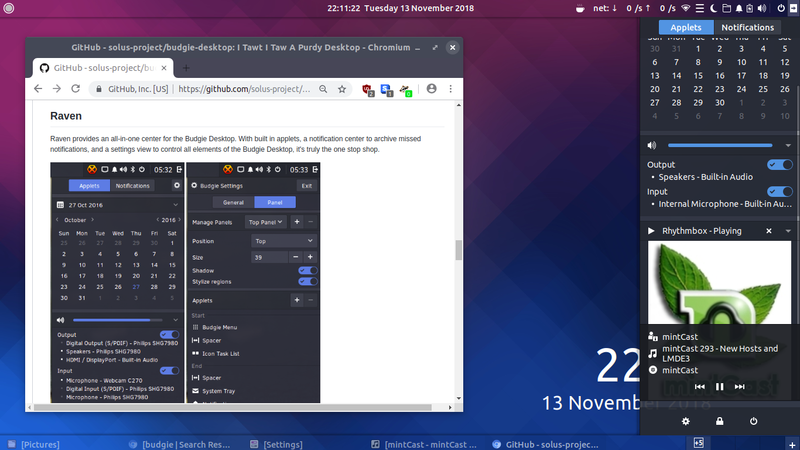 Raven is a simple right panel from Budgie that is simpler than other OSes' ones. It provides enough information for the user with minimal control. It won't look unfamiliar even for a new user. No configuration available, though. It has shortcut key of Super+A to open and close. It has transparent look by default on both Solus OS and Ubuntu Budgie, and will change according to your theme choice. It includes, on the bottom section, three very frequently used buttons of Settings, Lock Screen, and Log Out. 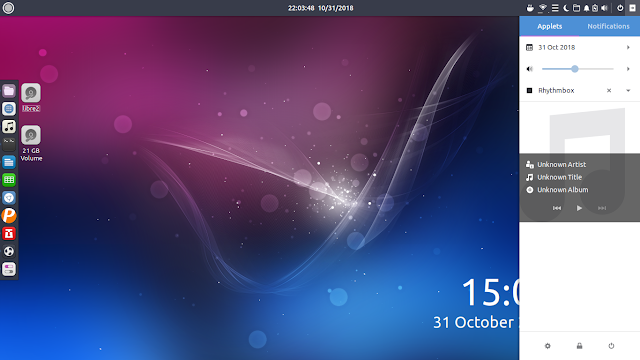 Last but not least, Raven is the star, it's fun to use, it's a unique user experience on GNU/Linux desktop, it makes Budgie really interesting. Anyway, next time I will talk about Applets as Budgie apparently has similar stuff as KDE or Cinnamon with their installable widgets. This will be more interesting. Enjoy Budgie!